In this article you will learn .NET Binary Patching and Reversing with Reflexil. Technically speaking a .NET built software or component (DLL) is an executable assembly, because it is compiled to MSIL and you can usually view the source in Reflector and many other tools such as ISpy and so on, but when it comes to commercial software you need to understand that more and more complicated protection mechanisms are being implemented to shield them and after analyzing many products I discovered many facts that all these components share to protect themselves. The most enticing reason for writing this article has been that I couldn't find any articles on this topic in detail. That is because hackers are still not interested in this platform yet. Today I have chosen a target that is unfortunately full of bugs so don't expect it to be very hard, this is just an introduction and later I will show more advanced targets such as code injection. Reversing is impossible without employing the appropriate tools. There are numerous software tools available out there that can be used for Reverse Engineering, some freeware and others are commercialized. Thus, understanding the differences between these tools and choosing the right ones is critical. It is up to you to decide whether your reversing projects justify spending money on software. In the context of .NET, the modification of software methods MSIL codes during run-time is very captivating; it aids to implement software protection, hooking and other amazing creativity. But there is an extensive challenge on the road; the IL code instruction could have been JIT compiled to native code before we are able to alter it; also the .NET CLR implementation is not detailed and it changes during each version, we need a stable approach without dependency to the precise memory layout. Reflexil is a great tool for doing an in-depth examination of various types of assemblies and also for the disassembling IL code towards a supported .NET language because it allows modifications of IL code using the powerful Mono.Cecil library. The Reflexil installation process includes a couple of steps. First of all, we need to download this. Actually, Reflexil is not full-fledged software; rather it is a plugin and can be attached to Reflector just by importing its linking DLL file. This DLL file can be downloaded from www.reflexil.net; in fact, it is apparently open source and not commercialized yet. Now, the real magic begins. We can manipulate the Reflector functionality along with the Reflexil features that we shall examine in the next section. 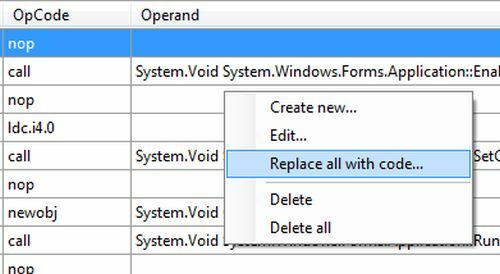 We can now overcome various limitations of Reflector such as .NET byte code editing and re-saving the assembly without the assistance of the Visual Studio IDE. Reflexil is especially a plugin or add-on for Red-gate Reflector, conceived to extend the functionality of Reflector. The Reflexil project is typically a .NET assembly editor, exhausting the open source Mono.Ceil libraries and capable of rewriting or manipulating MSIL opcode instructions as well as saving the modified version like to OllyDbg and IDApro. It has the following outlined advantages. 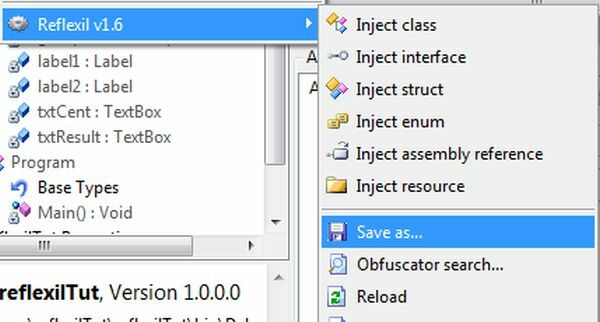 Code injection support with intellisense: It is possible to directly open the assembly source code into Reflexil rather than the Visual Studio IDE using code analysis and modification. This is the real beauty of Reflexil that is comprehensively utilized by Reverse Engineering. It also gives an impression of intellisense during code editing much alike Visual Studio 2010 editors. 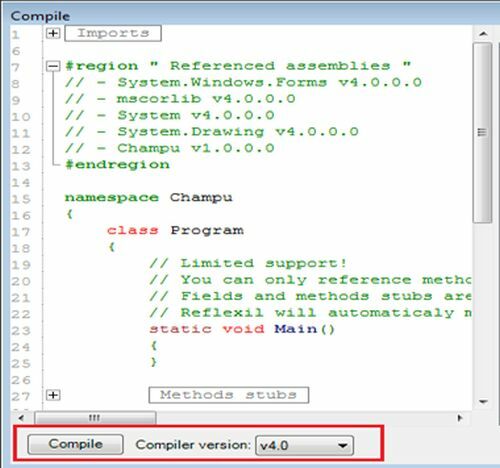 As you can see in the previous figure, we can update or insert code as well as re-compile it by choosing a specific compiler version. 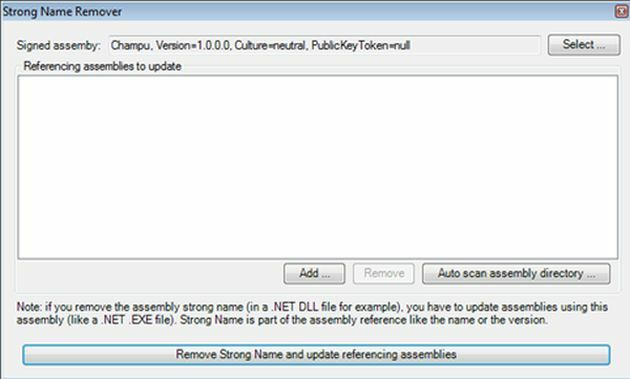 PE entry Verifier: Reflexil incorporates the PE file verification utility to confirm the assembly development platform origin because every assembly is executed under the CLR and would have a PE file entry. Resource Editing: Reflexil is capable of modifying or updating the linked resources, especially control, images, languages and so on, by mounting their code in hex format. We can modify any resource just by specifyng the corresponding byte sequences. Method attributes editor: Reflexil can easily modify any existing assembly methods signatures, scope and parameters entries. 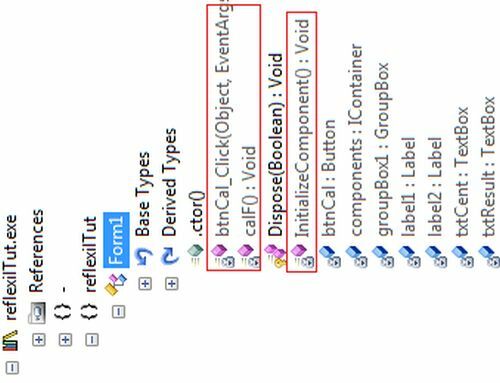 Rename, delete or inject entities: By utilizing code injection tactics, it is possible to insert, rename or delete a new specification such as class, methods, properties, fields and so on. IL instruction editor: Reflexil elude the auxiliary dependency over ILDASM in order to manipulate related MSIL code of an assembly. We can update any MSIL opcode instruction with great ease just by decompiling the entire IL code. Strong Name Remover: Assemblies are typically protected by a strong name so that no one can misuse them. Reflexil is capable of removing the signed assembly restriction just by removing their strong name. It can also remove the supporting reference assemblies. Assembly source code deciphering: Assembly source code can be protected by implementing obfuscation tactics to obstruct code dissembling by presenting some bizarre instruction. So, it is possible to de-obfuscate the source code of an assembly by Reflexil. The tools that are devised to dissassemble or patch the code such as CFF explorer, Reflector and Reflexil can be utilized both offensive and defensive intentions. It entirely depends on the user's discretionary attitude, how they actually frame the features for their needs. Some unscrupulous ones exploit these tools to do Reverse Engineering and some however utilize them to audit vulnerabilities in the existing code. The following code program is being manipulated by Reflexil in the context of depicting both defensive and offensive Reverse Engineering approaches. As an analog, we have download or obtained a software program that in fact has a couple of bugs. But unfortunately, we don't have the source code of this program to fix the bugs. Thus, we are employing Reflexil in this context to handle such inherent issues. Let's consider the following software and analyze its output. We'll identify a couple of glitches both in the functionality and user interface. This software is comprehensively substandard and is not fulfilling the client's expectations. We have provided only the executable of this malfunctioned software and we need to fix the following problems using Reflexil. In this scenario Reflector is not sufficient because this time we need to change and patch the byte codes for the proper functionality. Reflector is only useful to detect or identify the error by disassembling the source code. This is a very exhaustive task that requires extensive opcode analysis. Thus, ensure that the Reflexil plugin correctly configured and first open the Reflector. Therefore open this software exe file. 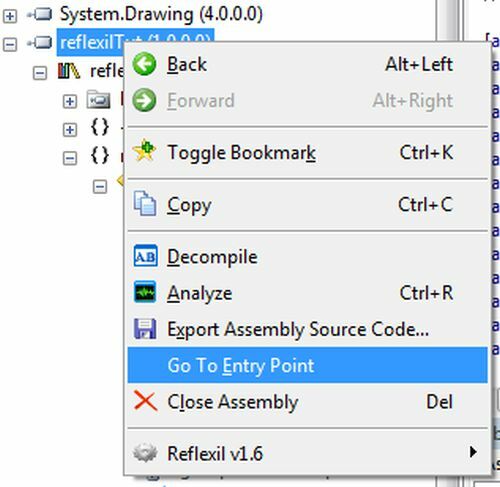 Now right-click over the reflexilTut namespace after choosing it from the left pane and select the option Go To Entry Point. Sadly, we have the malfunctioned software. So, after proper scrutiny of this software functionality, we have identified the following bugs that need to be patched (fixed) using Reflexil. 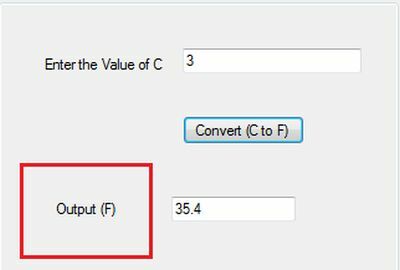 There is no output displayed in the output box after entering the value of centigrade. We can easily identify that the calF() method is doing all the calculation. 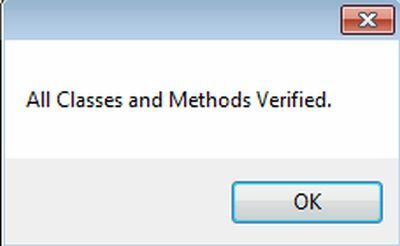 So the next point of checking is to confirm the calling of this method in the Button Click event method. Thus, decompile the button control code in the Reflector. Strangely, there is no calF() entry here as in the following. 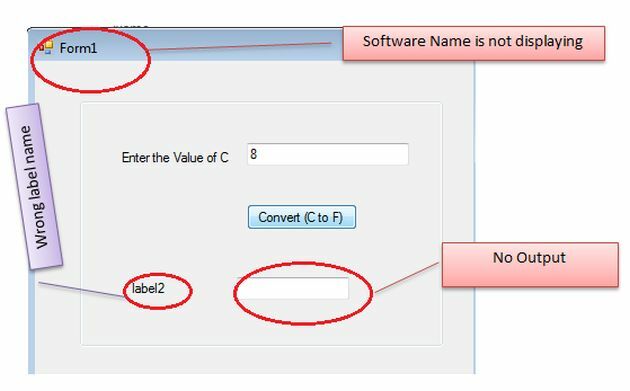 This software is also displaying label2 before the output TextBox that is senseless. The developer would have forgotten to change this value. 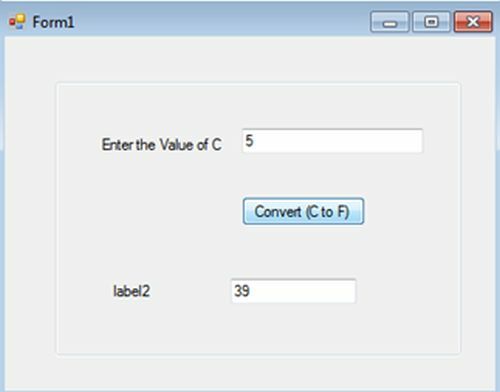 Select the InitilaizeComponent() method that is the repository of user controls. Find the relevant instruction that requires a bit of analysis as in the following. As per another strange error, this software is showing its name as Form1 that is in fact, beyond protocols and should be a meaningful name. So again, go to the InitializeComponent() method from the Reflector just by expanding the Form1 and notice that the ldstr instruction is showing Form1 as its operand value. Just select this instruction in order to edit its value. 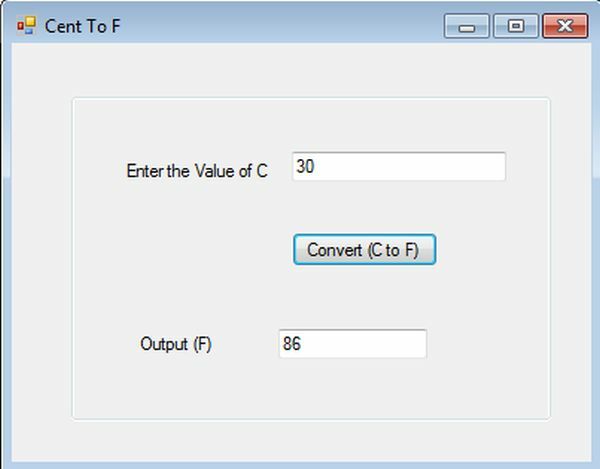 Here, change the string operand type to “Cent to F” and update as in the following. Hence, we need to replace this value with 32 to correct the functionality. Just select this instruction, right-click and choose Edit like to alter the values as earlier. This article intended to showcase the bug fixing process in existing software that is an inherent issue nowadays. It especially provided the working with Reflexil of one of the plugins of Reflector. 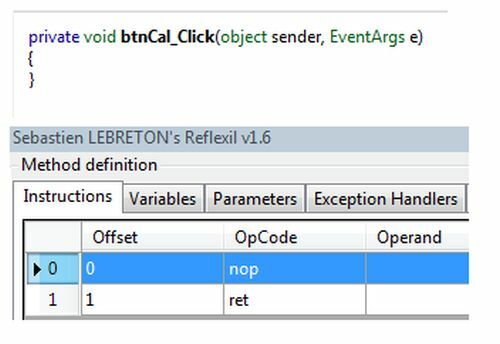 It elaborates the features and functionality in detail of Reflexil in the context of Reverse Engineering of .NET binaries. We have come to an understanding of patching or modifying the .NET binary code by utilizing Reflexil capabilities, especially intending to reverse engineer or exploit any .NET built software. 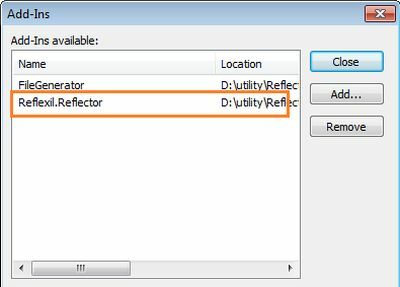 As we stated earlier we can't edit the source code or MSIL code by Reflector but now we can defeat this limitation of Reflector by employing Reflexil. This article describes the beauty of Reflexil in absolute steps by editing the corresponding byte code or source code without having the actual source code of software. In the next article, we shall show Code Injection tactics by Reflexil.